With the roundtable “Support for the survivors of sexual violence in facilitating the process for their status recognition: If not us, who else?” Medica Kosova concluded the two years project supported by Kvinna till Kvinna. The roundtable was honored from the presence of the new elected Mayor of Gjakova Municipality, Mr. Ardian Gjini; the Kosovo Ambassador of Goodwill at IHRC Ms. Elvana Shala; Mrs. Igballe Rogova as an Executive Director of Kosovo Women’s Network and Yllka Soba representing the Head Office of Kvinna till Kvinna in Kosovo. 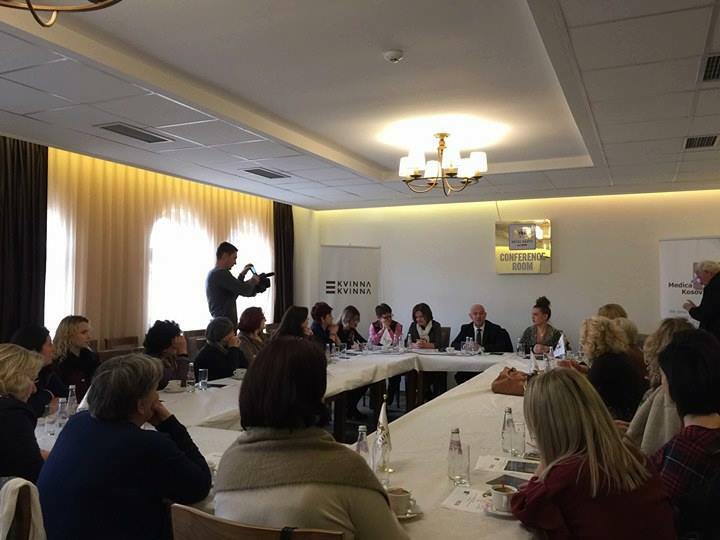 The roundtable gathered important partners of Medica Kosova to share the challenges and opportunities of supporting the survivors for their empowerment to request their status recognition during the upcoming process of law application. All the panel speakers recognized the role of Medica Kosova and other organizations in filling in Institutional gaps and supporting the survivors of sexual violence for the past 18 years since the end of the war. “Implementing an integrated access to legislation for the survivors of sexual violence during the war” is the fourth project supported by Kvinna till Kvinna for addressing the status and rights of the survivors. Considering the delay in starting with the status verification, the organization shared the fear and hesitation of the survivors to be part of the process; mostly cost by the stigma and lack of necessary support by their families and communities. However, this project applied an integrated approach through awareness raising, psycho-social and legal support towards a better preparation of the survivors to be part of their status verification procedures. The program is closed with the authorization of Medica Kosova and three other organizations by Kosovo Government for the representing the survivors in their status recognition. Medica Kosova and women who received support during the implementation of this project, appreciate the contribution of Kvinna till Kvinna from Sweden, who gave support during the last five years in addressing the rights of survivors of sexual violence in an integrated and comprehensive approach.